Snoring is a problem that affects about 45% of men and 30% of women, but it’s often not taken very seriously. If you snore habitually, however, your health and well-being could be seriously affected. It can also be associated with sleep apnea, a potentially dangerous sleep disorder. 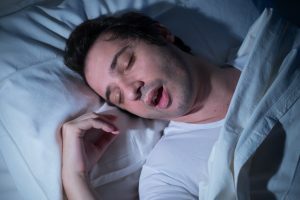 In this blog, the board-certified sleep doctors at eos sleep explain more about what happens when you snore and exactly what causes snoring. The sound you make when you snore is caused by a blockage or narrowing in your nose, mouth, or throat. The air that flows from your mouth or nose makes tissues in your airway vibrate due to a disturbed airflow caused by this blockage or narrowing. This vibration produces the loud sound you – and your bed partner – may have heard. The same sound doesn’t occur when you’re awake because the muscles in your throat hold the tissues in the back of your mouth in place. However, the muscles relax when you sleep, and the tissues can then collapse. Obstructed nasal airways, which can be caused by sinus infections, allergies, nasal polyps, enlarged nasal turbinates, or a deviated septum. Obstructive sleep apnea, a sleep disorder characterized by throat tissues that partially or completely block your airway. This causes repeated stoppages in breathing. Poor muscle tone in your tongue and throat, causing these muscles to become too relaxed and fall back into the airway. This can be caused by normal aging or by the use of alcohol or sleeping pills. Being a man: Men are more likely to snore than women, and they’re also more likely to have sleep apnea. Having nasal issues: Sinus infections and anatomical problems can cause blockages. Being overweight: Excess weight can cause throat tissues to become bulky. Having a narrow airway: This can be caused by a long soft palate or enlarged tonsils or adenoids. Family history: If you have a close relative who snores or has sleep apnea, your likelihood of having these conditions may increase. If you snore and want to learn about possible treatment options, make an appointment today with the sleep specialists at eos sleep. We offer many treatments for snoring to suit your specific needs, including non-invasive, minimally invasive, and surgical options. We’ll diagnose the cause of your snoring and recommend the least invasive treatment possible that will yield the best results.